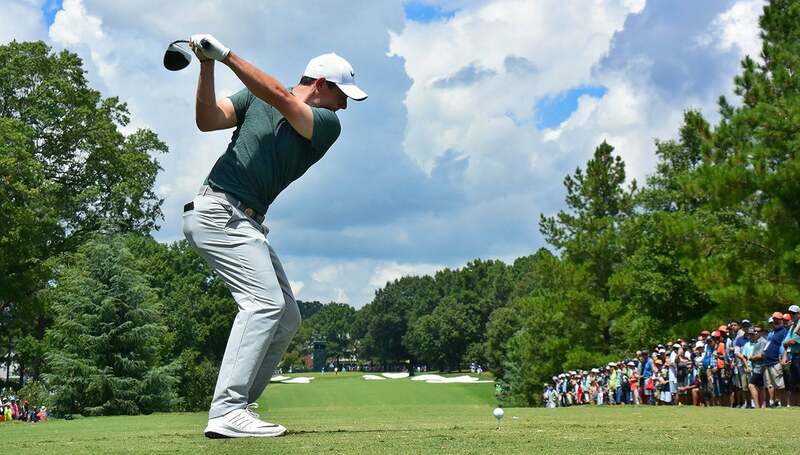 CHARLOTTE — The Seven Wonders of the World just added an eighth: Rory McIlroy hitting driver. It's become more apparent than ever this year. We've seen so many examples, we need no more. Watching McIlroy hit driver is officially more than a golf bucket-list item. It's an out-of-body experience. Who cares if he only hit six fairways and shot 73 on Saturday of the PGA Championship? The way this course was playing, he was probably out of this thing, anyway. McIlroy hitting driver is the must-see circus act you want to visit your town. He twists then recoils like a rifle. Low-flying planes aren't safe. Spectators laugh out loud at the sight of his ball traveling such preposterous distances. At steamy Quail Hollow, Rory's drives are more popular than those industrial fans that blow mist. When McIlroy hits driver it doesn't just sound different—it sounds violent. But you want more of it. It's like Morgan Freeman narrating a movie. It's simply a class above. Some of his bombs are already the stuff of legend. At the WGC-Dell Match Play in March he pounded one 410 yards through a walking path and almost pegged a spectator. Last week at the WGC-Bridgestone he hit 52 of 56 tee shots over 300 yards and ranked first in driving distance (328.7) by almost 10 yards. On Monday he even hit a drive over 300 yards — he claimed — while wearing a space suit for a sponsor's event. And then there was Wednesday's epic TV range session, which the Golf Channel hooked up with Trackman technology. The broadcast team couldn't even focus on a conversation. McIlroy's cuts couldn't be contained. He warmed up with 3-woods that carried 315 yards before taking out his driver—the first of which carried 350. After that, it was a parade of TaylorMades flying across the property. Despite the club-speed, McIlroy's rhythm remains smooth. One practice swing, step back, stare down the fairway, raise the left arm, maybe fix the sleeve on the right bicep, two glances down the fairway, two quick shimmies. Then, boom! On 11 he hit a 328-yard drive that curved around the bunkers and landed in the left rough. Later on 11, down the fairway: "Look where Rory is!" This has happened all week. For the first two rounds, McIlroy was grouped with Jon Rahm and Rickie Fowler — neither are slouches off the tee — yet he routinely pumped drivers well past them. The Twittersphere went nuts. Three of the nine longest drives this week belong to McIlroy (he also leads the field in strokes gained off the tee). McIlroy isn't built like Dustin Johnson. He's listed at 5-foot-10 and 160 pounds, which could be an inch generous. He's stocky and strong, and his swing is pure. "He basically works his upper body back away from the ball going back, so he's flexible, but he is also extremely strong, and you need that if you are not a big guy to hit it consistently long," said Brady Riggs, one of GOLF's Top 100 Teachers and the coach for Brandon Hagy, who ranks second on Tour in driving distance behind Dustin Johnson. (McIlroy would rank first at 318.8 per drive if he'd played enough Tour rounds to qualify.) "Basically he decelerates great, and that's critical if you are going to create a lot of speed. You have to get everything flying and then get everything to stop in the right order, and he does it. "Technically, he is just brilliant." "He's just strong, in his core especially," said Omar Uresti, one of McIlroy's playing partners Saturday. "He's got really fast, fast-twitch muscles." Uresti was one of the 20 club pros to qualify for the PGA. At 49 he is playing in his third straight and made the cut for the first time. A PGA Life Member, he has six professional wins and has won roughly $4.5 million in his career. Yet he is not a power player—he ranks last in the field in driving distance (268). On Saturday he was out-driven by McIlroy by more than 50 yards on nine occasions. On 15 and 16, when McIlroy was heating up, he outdrove him by a combined 144 yards. On 16, the long, dogleg-right par 4, McIlroy cut the corner by flying it over a bunker with a drive that traveled 347 yards, his longest of the day. "I think I was talking to (James) Hahn's caddie, and I was like, ‘I could take it on that line too, and I'll be safe as well—but short of the bunker,'" Uresti said, laughing. After his round Saturday, McIlroy, who is 11 shots behind Kevin Kisner's lead, was asked if he plans to hit more 3-woods Sunday, hoping to keep the ball in the fairway. "I guess at this stage of the tournament, what is the point," he said. "You may as well try to get it down there." In other words, the show's in town for one more day.